One of a kind Jaali Hamadan 100% Silk on Cotton with intricate craftsmanship. Colors are Sky Blue and mix of Rust and Gold and is a perfect blend for today's interior design decor. Ideal as a Wall hanging piece of Art as well. 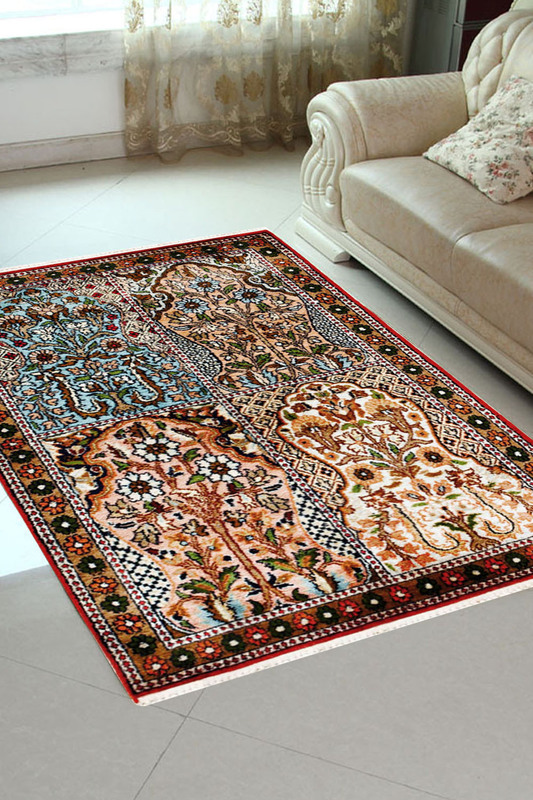 - Very Exclusive Jaali Hamadan design Handmade rug with unique craftsmanship. - One of a kind rare pattern rug. It has taken 6 months to weave this rug and has been by our skilled artisans. - It has 324 Knots per Square Inch.Primary Colors are Sky Blue, Rust and Gold. - Perfect as a Wall Hanging or a Bed Side Rug. - The Design is originated from a town called Hamadan in Persia and is also called the Jaali Design.